Start saving time and money soon. TinkerList takes less than a week to implement. Learn how to work with TinkerList in only 2 hours and your platform will be up and running in less than a week. With audiovisual content neatly stored on TinkerList along with their sources, it becomes much easier to export rights. TinkerList is a tool that makes the work of my team much easier. When we first started creating our daily talk show with TinkerList, I had my doubts. But the integration went smoothly. In less than a week we were ready to start working. The people from TinkerList came to us to give a 2 hour workshop. After everything was clear and everyone was ready to switch to TinkerList. Sometimes when we had small issues or didn’t quite understand a feature, we could just talk to the support team and they would react almost immediately. That close contact with them made sure we were doing great. After the integration I already noticed that things got done more quickly. There were less people running around with papers or hard-drives. The team was really saving time and working better together. Not only during preparations but also during recordings. The technical team is happy that they now have access to everything. No more asking for the script and audiovisuals. Everyone is now up to date. For the technical team the other advantage was that they could sync TinkerList with different devices like the prompter. 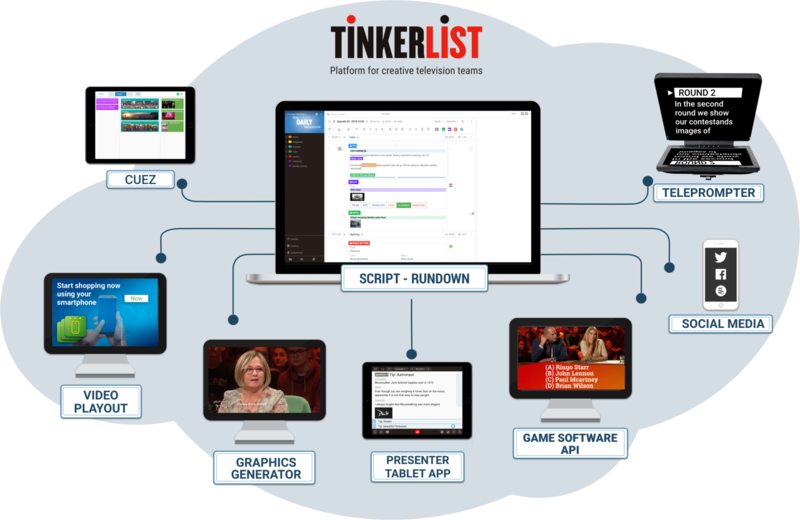 As an executive producer I’m usually not involved in the content creation but I still like to go into TinkerList and check up on what they are doing. Therefore, I go to the planning on TinkerList and see what needs to be done, what they are doing now and what is already finished. A quick and easy way of staying up to date without losing time by having to ask someone. I would advise TinkerList even for you as an executive producer. Make your team save time and prevent unnecessary stress. You will save money along the way.